Laplace transform methods can be employed to study circuits in the s-domain. Laplace techniques convert circuits with voltage and current signals that change with time to the s-domain so you can analyze the circuit’s action using only algebraic techniques. Connection constraints are those physical laws that cause element voltages and currents to behave in certain ways when the devices are interconnected to form a circuit. You also have constraints on the individual devices themselves, where each device has a mathematical relationship between the voltage across the device and the current through the device. Here you learn what connection constraints, device constraints, impedances, and admittances look like in the s-domain. The basic form of KVL remains the same. Piece of cake! You can easily transform the i-v constraints of devices such as independent and dependent sources, op amps, resistors, capacitors, and inductors to algebraic equations in the s-domain. After converting the device constraints, all you need is algebra to translate current and voltage relationships to the s-domain. The constants μ, g, r, and β relate the dependent output sources V2(s) and I2(s) controlled by input variables V1(s) and I1(s). The preceding three equations on the right are s-domain models that use voltage sources for the initial capacitor voltage vC(0) and initial inductor current iL(0). You see there are no integrals or derivatives in the s-domain. The middle column here shows the constraints of the passive devices in the time-domain being converted to the s-domain. 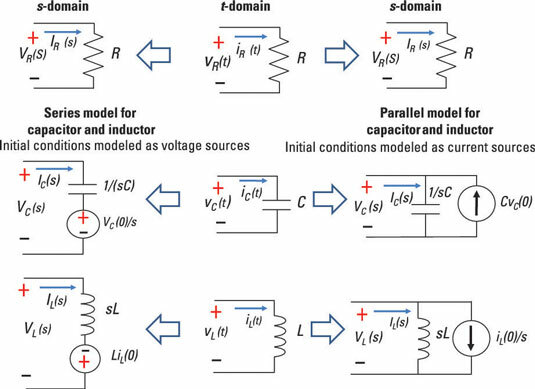 The left column shows initial conditions modeled as voltage sources in the s-domain, and the right column shows initial conditions modeled as current sources in the s-domain. Taking the initial conditions into account in the s-domain analysis for capacitors and inductors is a big deal because it expedites the analysis. When you transform differential equations into the s-domain, you deal with input sources and initial conditions simultaneously. Now you’re ready to start analyzing circuits in the s-domain — without having to rely on calculus.